Tomorrow morning (20th April) sees the start of a marathon walk for lots of hardy (foolhardy?!) Melbourne souls. Teams of 4, 100km, 48 hours to complete. All over Australia, and in fact, in 13 countries worldwide, committed groups of the fit and not-so-fit are setting out to raise money for Oxfam‘s fantastic poverty alleviation projects. Since 1981, the Trailwalker event has raised more than $100 million. Wow! Jen, my walking companion on the Overland Track in Tasmania earlier this year, is on a team with 3 other friends and together they have persuaded sponsors to part with over $10,000. That’s quite an incentive to walk through the night/pain. This year, the Trail will take them through Jells Park – Churchill National Park – Lysterfield Lake – Ferny Creek – Olinda Creek Track – Graham Colling Reserve – Woori Yallock – the O’Shannassy Aqueduct – Warburton. That’s some walk! While these mammoth walks are a long way from the short walks in my books, it’s incredibly inspiring to see people putting their foot power to such good effect. Have you ever participated in an Oxfam or other charity long distance walk? Thought about doing so? What was your experience? What’s holding you back? ……. Here’s the update you’ve all been waiting on: They made it! 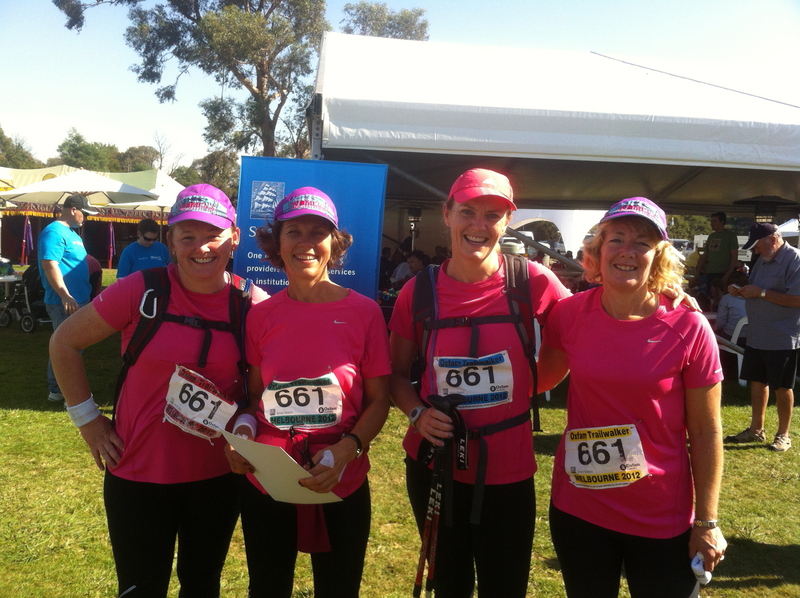 Jen and her three team mates walked the 100km in just 26 hours and 43 minutes and raised over $13,000 in the process. And with nothing other than some major sore feet and a few blisters. What legends! Well, Greg, I reckon we better ask Neil over at Bushwalking Blog, then! Only thing, is, if you are going to photograph it for your blog (I am sure we can find a march fly or two! ), and Neil and I do notes for ours as we go, there’s a good chance it might take us 200 hours!!! Nearly did the Oxfam Trailwalker this year but just missed registration… Trying to get a team together for 2013. Much respect to everyone who takes part. It’s a great event! I have been known to turn a 3 hour walk into a 6 hour walk, by the time I’ve stopped a million times to take photos. I have a fairly good memory though, so I don’t take many notes. I am already waiting on a few people to get back to me about being part of my team but let’s revisit closer to the time. Maybe we could find another Vic blogger to form an all-blogger team? I’m with you Neil – my walks take double the usual time, by the time I change routes, map, photo, write. Needless to say I have VERY patient walking companions! Maybe we could be the action-tweeting crew, describing the pain step by step! I would have to do a LOT of training to be able to handle 100km in one go though wouldn’t rule it out. So inspiring! I had a team ready to go this year but just missed registration also – seems you need to be very quick to get in! Isn’t it fantastic that it’s so popular, Prue! Hope both your team and Neil’s make it in time for next year’s.